13 Insane Penguins and Squirrels: Thanksgiving quilting marathon. 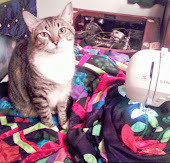 I have been sewing a marathon and I still have 2 more days to go. 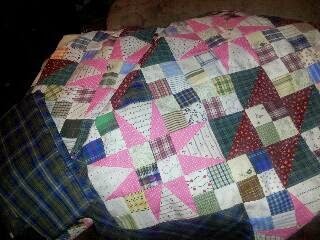 I have only the outer border on my cathedral stars quilt left to do and I have made 9 blocks. Both are Bonnie Hunter patterns. The first is on her web site, Quiltville.com and the blocks are a future book. I liked the blocks so much, I drafted a pattern of my own size. They finish at 6 inches. 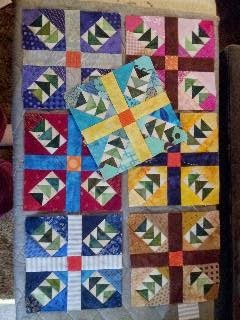 The 4 flying geese corners are paper pieced. I am using up my little scraps. It doesn't look like it when I look at the scrap box, but the trimming garbage can does. The nicest part is, most of the scraps were given to me. I love the flying geese blocks. I made a few too, but I used scraps.